Richard Haass should consider coming up with his own proposals if Northern Ireland's parties cannot find agreement before Christmas, the SDLP's Alex Attwood has said. 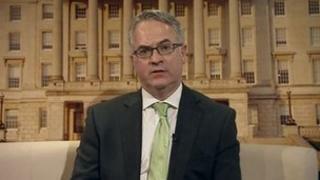 The US diplomat is in Belfast to chair inter-party talks on parades, flags and Northern Ireland's past. Mr Attwood said the diplomat should "put it up to the parties," if necessary. He said Mr Haass should not go home and leave the parties to sort it out. Mr Attwood, who is a member of the SDLP's negotiating team at the talks, was asked if this meant a "take it or leave it" document. "At the end of it, yes, put it up to the parties. If they can't agree, give best advice," he said. "We said very clearly to him that if the parties can't agree come Christmas, then you give your best advice, and best recommendations about how to deal with these issues that are contentious. "But whatever happens, don't go home leaving it to the parties to sort it out." Speaking after meeting Dr Haass on Tuesday evening, Mt Attwood said any proposals from Mr Haass should be "embedded in the values of the Good Friday Agreement".